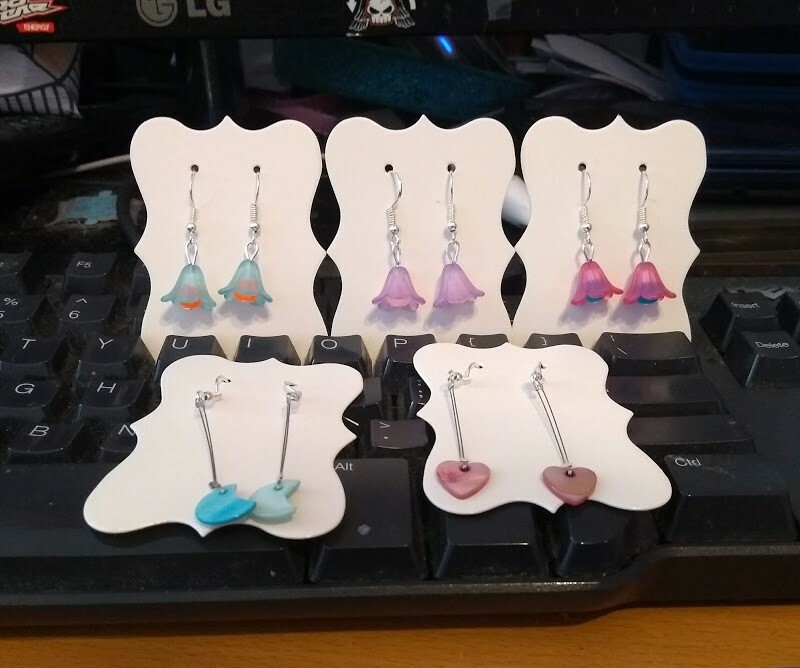 I only got around to trying to make a few bits for the fete this afternoon, and my direction is apparently earrings. I’ve only done the two styles for the moment, but I like them and plan on doing some more in these veins. I’m very exhausted from weather right now. It was the school sports day, so we went to cheer Smalls on. But yanno, it was roasting hot with only a tiny breeze, and it wasn’t pleasant to be out in unless one was secreted in a patch of shade. It looks as if the coming week is supposed to be fairly toasty, so hopefully I won’t have to go out into it much. At least I know as of today that if I remember to take my nasal spray, I can breathe a bit more freely than the heat/humidity/pollen trio would otherwise permit (what a freaking surprise, ha ha). Right, I should go make some food happen. We’re doing cold dinner tonight since it’s warm, which means I should go make a sandwich or something.